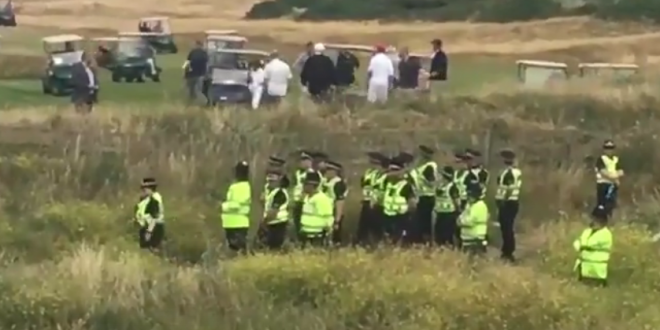 Scottish Protesters Hurl Abuse As Trump Golfs [VIDEO] - Joe.My.God. A group of protesters gathered at President Trump’s Turnberry golf resort in Scotland on Saturday, chanting at him as he played the course. “No Trump, no KKK, no racist USA,” the protesters could be heard chanting at Trump in a video posted by a BBC reporter. Trump has faced widespread protests during his trip to the United Kingdom. About 250,000 people turned out on Friday for mass demonstrations against the president in London, though his schedule largely kept him away from the protests.